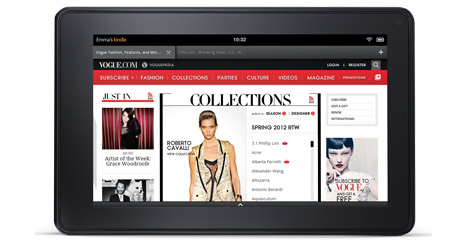 Amazon's Kindle Fire: Oh No They Didn't! Amazon's tablet packs a ton of features at less than half the cost of the iPad 2. Yup, we want one. Well, Apple's October 4 press event just became even more interesting. That's when the folks in Cupertino plan to reveal the next, and rumored, iPhone 5, but if they're smart, the corporate suits will also address the iPad and iPad 2. Make no mistake. Amazon just declared thermonuclear war on Apple with Kindle Fire, an Android powered device that is smaller (seven inches), lighter at 14.6 ounces and, most importantly, is significantly cheaper at just $199, in comparison to the base model iPad that costs $499. Yes, it lacks a camera and microphone. Yes, it may not be able to push the same quality graphics, but come on. Do you really think any of that matters to the buying public at large, especially when it runs Angry Birds, Cut the Rope and Plants vs. Zombies without a hitch? Our holiday wish lists just became more attractive. All these people want is a high-quality device that lets them surf the web (via Amazon's Silk Browser), download TV shows and movies, play music and read books. Heck, users can even play music in the background while they read books. Whether critics like it or not, Kindle Fire will be THE must have tablet (note we avoided saying "gadget") this holiday season. This goes for Apple fans, Windows fans, moms, dads and the whole family. Seriously, why not? It costs $199. That's $50 less than what Nintendo's 3DS used to cost, which only goes to show how out of touch the gaming industry is. Whether or not the user experience rivals the iPad 2's remains to be seen, but at that price, Amazon already sold us. This brings us back to Apple. What's the next move? A price drop? A redesigned iPad? A new software update? Sit back and relax. Things are about to get real interesting.